The music of Keith Green and his biography, No Compromise (written posthumously by his wife, Melody Green) greatly impacted the life of Jesse Boyd, FPGM's founder, so much so that two of his children (Bethany Grace & Josiah) are named after the two children of Keith that were killed with him in the tragic plane crash back in 1982. Jesse Boyd poses with Bethany Grace, his infant daughter, at the grave of Keith Green and his two children in Garden Valley, TX. Keith's testimony was used by the Lord to bring Jesse to saving faith and obedience to the Great Commission in New Testament simplicity. His untimely and sudden death at so young an age loudly declares the truth of Isaiah 57:1: "The righteous perisheth, and no man layeth it to heart: and merciful men are taken away, none considering that the righteous is taken away from the evil to come." Praise God for this and that "he being dead yet speaketh" (Hebrews 11:4). The video documentary of Keith Green's life linked below is a real blessing as is all of his music. Unlike the claptrap that passes off for "Christian Music" today, Keith wrote all of his own songs. They were bold, doctrinally sound, theologically profound, and in their message, the Gospel was never veiled. Keith didn't sell tickets to his concerts, and he was known for giving his music away for the sake of the Gospel. His music was a ministry and not a career. Earl Taylor Green was the maternal grandfather of Jesse Boyd. He served on the North Carolina Highway Patrol for 30 years and was a bold witness for the Lord Jesus Christ in his local sphere of influence. His example had a profound impact on the work of Full Proof Gospel Ministries and its labor for the Gospel all over the world. His support, prayers, and bold example are dearly missed. Edith Long Boyd was the paternal grandmother of Jesse Boyd, Full Proof Gospel Ministries' founder. She was the faithful wife of a faithful pastor for more than fifty years and the paragon of the Proverbs 31 woman. While Jesse Boyd was studying the Word of God in college and seminary, wrestling with a call from the Lord to the Gospel ministry, he often visited his widowed grandmother in Greenville, South Carolina and spent hours feeding with her around the Holy Scriptures. The last time she spoke to him, a telephone call he made from the middle of nowhere in the California desert on February 16, 2003, Edith garnished enough clarity in her dying days to once again admonish her grandson, as she had done many times, to seek God's will and be obedient to it without compromise, "to make full proof of thy ministry (II Timothy 4:5). Jesse then told her he was going to ride a bicycle across America and preach the Gospel from coast to coast. She praised the Lord. Five months after her death, that bicycle ride began with a back tire in the waters of the Atlantic Ocean and Full Proof Gospel Ministries was born. In her will, Edith Boyd left to her grandson an original page from a first-edition 1611 King James Bible that her husband received in 1998 as a token of appreciation from his flock for fifty years of faithful service in ministry. Interestingly, it was a page bearing II Timothy 3:1-4:13. Right there in II Timothy 4:5 on this 400+ year old Bible page is Paul's last exhortation to young Timothy: "make full proof of thy ministry." From this verse, Full Proof Gospel Ministries takes its name, a subtle recollection of this same exhortation often restated and reiterated by Edith Boyd to her grandson. Larry Beal was Jesse Boyd's first martial arts instructor. He was tragically killed in a farming accident in 2010. The following is a transcript of Jesse's statement given at Sensei Beal's funeral on November 18, 2010. What more can be said? “The beauty of Israel is slain upon thy high places: how are the mighty fallen” (II Samuel 1:27). I truly believed that Larry Beal was the best martial artist in the world, and it was an incredible honor to have been mentored by him. More important than skill, however, was the humble meekness that clothed his character and the selfless patience required to train the untamed punk I once was. Under Sensei Beal’s tutelage, the Lord taught me much that I have literally carried to the ends of the earth: wisdom that has often led away from precarious hazard and knowledge that continues to serve as a bridge for the bold proclamation of the Gospel of Jesus Christ. Thank you, my old friend. Newton Martial Arts and is ever at a loss by your passing. May I and those you have entrusted be counted worthy to teach others as you have taught us. “How are the mighty fallen, and the weapons of war perished” (II Samuel 1:27). Of great comfort is my remembrance of once confronting the one who awarded me a black belt with the things of the Lord and the glorious Gospel. I rejoiced as my Sensei assured me that his faith and trust was in Christ alone. Almighty God is faithful to His promises and His Word is absolute truth, therefore see “that ye sorrow not, even as others which have no hope. For if we believe that Jesus died and rose again, even so them also which sleep in Jesus will God bring with him . . . and so shall we ever be with the Lord” (I Thessalonians 4:13-17). Sensei Beal, my old friend: You have seen the Blessed Saviour’s face, how can I not envy? I will look for you in the Kingdom. “The righteous perisheth, and no man layeth it to heart: and merciful men are taken away, none considering that the righteous is taken away from the evil to come” (Isaiah 57:1). When Larry Beal (see above) was tragically killed and went to be with the Lord in 2010, Brian Chapman spoke some powerful words at his funeral. Later, Jesse Boyd came to know Brian personally when some real trial, tribulation, and betrayal had him seriously considering hanging up his black belt for the last time. Now, it's apparent that the Lord put him in Jesse's life as a real friend and Christian brother at a time when he needed one in martial arts circles. 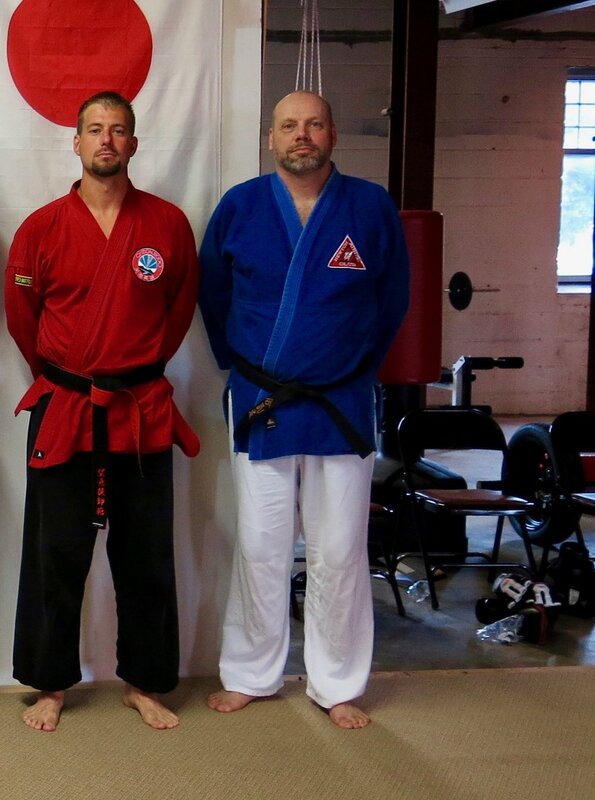 He was invited to train in Brian's dojo, and Brian helped him to open a dojo of his own over in Hickory, a school that continues to operate today. In the beginning, when it was just Jesse and a few beginner students, Brian would come over to teach and lend support during student promotions. Some of those beginners who have Brian’s signature on their early certificates are now black belts themselves. 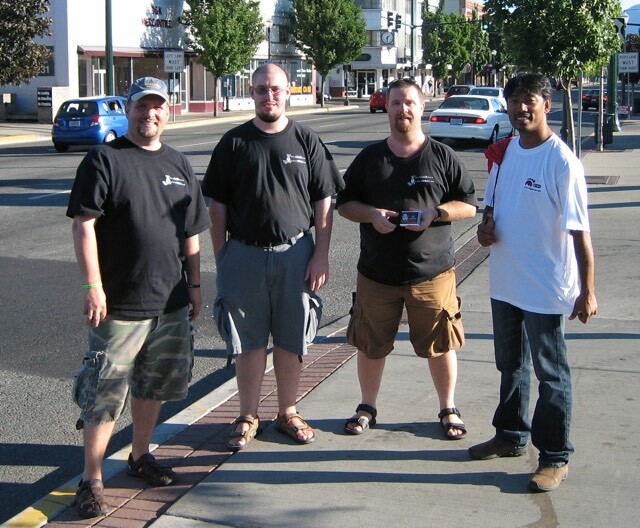 Had it not been for Brian’s friendship, Jesse very well may have quit martial arts altogether, and the opportunities that have arisen since to use martial arts as a tool to point others to faith in Jesus Christ in places like South Africa, Bangladesh, India, Nepal, and Israel would have never happened. In 2015, Brian Chapman went home to be with the Lord after a sudden and brief 6-month battle with Lou Gehrig's disease. He leaves behind a wife and two young daughters. Jesse Boyd had the privilege of reading Psalm 23 to Brian in his hospital bed while encouraging him to go dwell in the House of the Lord. Immediately thereafter, Brian took his last breath. Several days later, Jesse had the distinct privilege of preaching Brian's funeral at Hoyle Memorial Baptist Church in Lawndale, NC and in the presence of many martial artists who knew not the Lord Jesus Christ. Brian's adamant request concerning his funeral was that it be PREACHED. Was it? You be the judge. Since that timely meeting, FPGM and Jim had stayed in touch, sharing one another’s newsletters and mutually encouraged to see the Lord’s doing in and through one another's boldness. On November 13, 2008, Jim Jones went home to be with the Lord. He was hit by a paving truck while riding his bicycle near his home in Grants Pass, Oregon. Jim used to be a druid priest and was heavily involved in Wicca before God saved him. Having only spent one afternoon with this brother on the streets, it was plainly evident to us that he was a bold preacher of the Gospel, one of a very small remnant in America. “How are the mighty fallen” (II Samuel 1:19)." Jim leaves behind a wife and two daughters. Please pray for this family. No one at Full Proof Gospel Ministries ever had the privilege of meeting David Mann personally. Notwithstanding, we often heard mention of this bold brother's name as we preached alongside some of his ministry partners and personal friends down on the Las Vegas Strip. From the first moment of his conversion in 2006, David put himself on the front lines for the Gospel, often preaching to the masses of tourists in Las Vegas. He was also instrumental in organizing and coordinating the Las Vegas Outreach Team that regularly and faithfully took the Gospel to the Strip. On March 29, 2012, David was tragically killed by a reckless driver. At the scene, Gospel tracts from his car trunk were strewn all over the highway as was his little white preaching stool. Sometime later, Full Proof Gospel Ministries came into possession of this stool, given to us by one of David's ministry partners. It has been our great privilege to carry this stool all over the world and to use it as David faithfully used it to declare the Gospel of Jesus Christ publicly and in the open air. The first video that appears below highlights some of FPGM's preaching in Africa. The little white stool you often see is David's stool.